Quantum is located in the beautiful rolling hills of Western, PA in the small and historical town of Saxonburg. We have been in the glass industry since 1976 when our founder Joseph W. Kozora began developing methods for applying coatings to the metallic glass container forming components. Our company soon moved into plunger mechanism rebuilding, and then into the development of our own glass container forming systems. We have developed many technologies that have revolutionized the glass container forming industry. 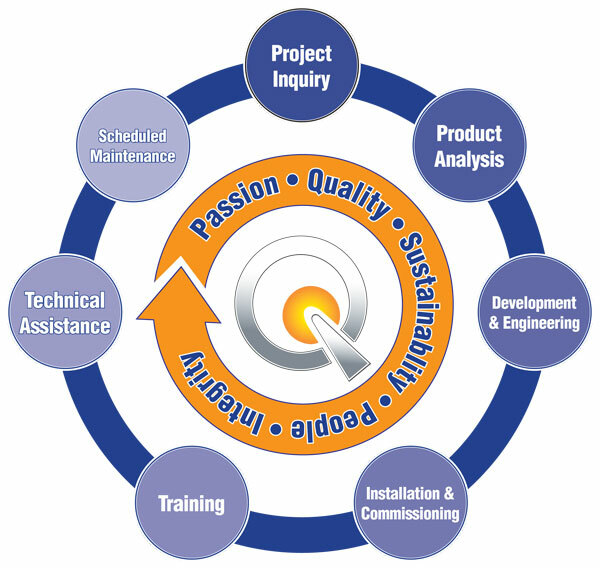 Quantum is the leading innovator in the industry to improve production processes that reduce costs and improve the product quality of our clients around the globe. At Quantum, we remain committed to the intelligent engineering of glass container forming systems. Our mission is to support our customers to achieve sustainability, maximum return on investment and quality products with our extraordinary advanced core technologies. At Quantum we believe that solving your container forming problems is more than just a part of our business, it is our only business! Our vision is a sustainable and greener world, where glass packaging is the first and affordable choice of consumers. Quantum is committed to helping glassmakers keep glass the best packaging choice. Passion For Customers & Results: We are passionate and determined about our business, our people and our product. We love success and believe that working together is the best way to achieve positive results. Environment & Sustainablity: We love our planet. We aim to develop and implement technologies that will help preserve and promote a more sustainable environment. People: We treat one another with respect. We strive to build a positive team and family spirit. Honesty & Integrity: We believe that great relationships and open communications must be based upon honesty. We act with integrity and hold ourselves to the highest standards of behavior.